When children become teenagers, freedom is usually the first thing that comes to their minds when you ask, "What do you want?" It's no surprise, then, that when handed the keys to their very first car, teens become ecstatic. They want to drive everywhere, all the time, especially with their friends in the passenger seats. 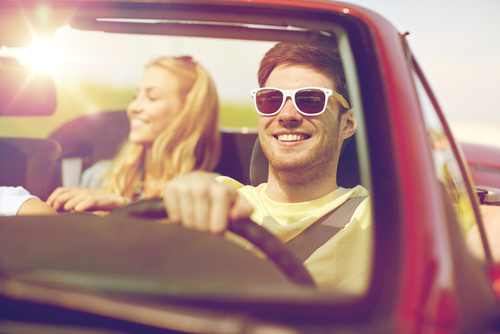 However innocent, this eagerness for freedom can prove to be dangerous for your new driver. So before you let your teen drive off into the sunset, find out how you can encourage them to stay safe behind the wheel. Laws have changed since the time you first drove, and the statistics on teen driving have never been clearer than they are today. Take a look. In 2016, a total of 86,988 teen drivers were involved in a crash in Texas alone. That's 8.5 percent of all crashes in the state. In California, the crash rate for 16- to 19-year-old drivers that led to an injury or fatality is 2.7 times higher than drivers of all ages. For 16-year-old drivers, that statistic rises to 3.7 times higher than all drivers. In Florida, teen drivers were involved in 42,874 crashes in 2015, with a 29.85 percent increase in fatalities over the past year. What causes these crashes most often? The New York State Department of Health reports that most crashes are caused by distracted driving, speeding, tailing vehicles too closely, failing to yield to other drivers and driver inexperience. Most teen fatalities and injuries in crashes involve teens not wearing seat belts. Teens are also more likely to get in a fatal crash at night. Combine any of these factors, and the risk becomes exponentially greater. The good news is that parent involvement can significantly reduce these teen driving behaviors. Parents can encourage safe driving habits for their teenagers in many ways. Setting a good example for your children by staying safe yourself is the most important action you can take. Ensure they understand traffic laws by enrolling in safe driving classes with them. Have your teen take state-specific DMV permit practice tests to further reinforce their knowledge. Establishing rules for driving like limiting the number of friends they can have in the car or the hours they can drive also help reduce their chances of being in an accident. Many parents also create a written agreement with their teen that lists driving restrictions and consequences for breaking the rules. Post the rules or agreement next to their car keys or beside the door so they're reminded each time they go out for a drive. Role-playing common incidents on the road prepares teens for real-life encounters. Some situations you might bring up with your teen are: following trucks with loose materials in their truck bed, being the first vehicle at a red light and seeing an animal crossing the highway. Parents can't always be there to keep their children safe, but preparing them for the road reduces the risks of driving. Knowing your state laws, teen driving statistics, traffic laws and defensive driving techniques help your teen driver navigate safely. If they put that knowledge into practice, your teen may just impress you with their newfound responsibility.